Discover the Martial Art of Tai Chi Chuan. Tai Chi Chuan is an ancient internal Chinese martial art which has gained widespread popularity for its many health benefits. Today, most people practice taiji slowly to develop their balance, strength, and vitality, and the martial applications of the art are often ignored. Tai Chi Chuan is a highly effective form of combat specializing in short and middle-range fighting. This program offers practical martial applications for each of the 37-postures of traditional Taiji, based on the forms passed down by Yang, Ban-Hou. Martial applications found within tai chi chuan are a direct link to your tai chi as a form of self-defense. When you study the martial side of tai chi, you can become proficient in a variety of high-level skills, including sensing, neutralizing, yielding, striking, chin na, and even throwing. If you know a tai chi form, you are going to discover the essence of your movements by becoming aware of their martial applications. If you are practicing tai chi pushing hands, you will greatly improve your skills with this understanding of martial applications. If you are ready, you are going to love the amazing tai chi fighting set. This fully choreographed set (requires a partner) will combine all your tai chi skills into one 5-minute routine. For any style of tai chi chuan, this book will be important for practitioners who wish to develop a deeper understanding and advanced skills. Learn how to analyze the forms and defense applications in your tai chi, gaining higher-level knowledge of your style. Discover the martial applications ofYang style. These insights will give you greater understanding of your own art. Find inspiration. 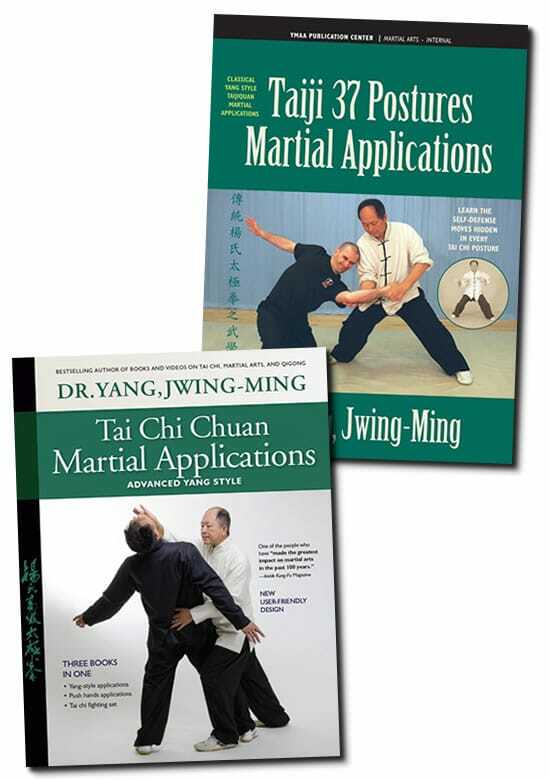 Master Yang's writing will inspire you to investigate the martial applications of your tai chi style. Features senior YMAA students Pedro Rodrigues, Tony Chee, and Kathy Yang. Dr. Yang's tai chi can be traced back to the Yang family through Grandmaster Kao, Tao (高濤) and his teacher Yue, Huanzhi (樂奐之), an indoor disciple of Yang, Chengfu (楊澄甫).